When you decide to buy a used car, you can buy from either a used car dealer or a private party. Many people think they get the best deal purchasing from a private party but there may be issues that they have not considered. For example, a private party seller is not bound by the same strict state and federal laws as are dealerships. Most private sellers sell their used cars “as is," meaning, there’s no warranty so you're responsible for any problems that surface after the purchase. And unlike purchasing through a dealer, in many states, consumers are limited by law to purchasing a used car warranty from a registered dealer. It’s highly unlikely that a private party seller will be interested in your trade-in, and you have to handle all the financing through your bank, credit union, or other lender. If your credit isn’t perfect you may find you have to apply to multiple lenders in order to get approval for a loan. Dealerships have existing relationships with a variety of lenders and usually find a good fit for you at a price and interest rate that you can afford. After all, it’s bad for business for the dealer to sell you a car that you can’t afford. Image what you’d tell everyone about that dealer at your next family picnic. Finally, handling all the paperwork is between you and the private seller, including the bill of sale, transference of the title, submitting the registration and handling all related taxes and fees. Most often, these transactions mean one or more trips to the DMV. And depending on the laws in your state of residence, you’re required to make certain the vehicle is current on its smog and safety inspection requirements. On the other hand, buying a used car from a dealer takes a lot of pressure off of you because typically the dealer handles financing, registration, compliance, and can even offer a warranty. A vehicle purchased through a car dealer has typically undergone a thorough inspection and any required items repaired. The dealer will likely provide you a copy of the inspection and repairs. 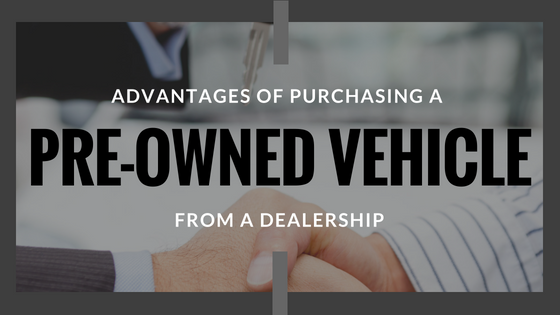 The dealership may even accept your existing vehicle as a trade-in down payment. Price is typically the first reason mentioned by someone who insists on purchasing only through a private party. While you may find it much easier to negotiate a price you want with a private party, however there could be hidden dangers. For example, because of the stringent federal and state laws dealerships must follow, you're less likely to run into problems such as purchasing a lemon or undisclosed salvaged vehicle. And if the price seems “too good to be true” you have to question why the private party wants to sell the car so quickly and cheaply. And the private party seller has no window into your financial situation, so they’re not in position to advise you as to whether the car payments will fit within your budget. Going over our list of pros and cons above might make you feel as if buying a used car from a dealer is the way to go—and for many, it is. The convenience of having someone else handle not just the paperwork but assist you in finding the right financing is a big plus. In addition, you receive a car, truck, or SUV that’s been thoroughly inspected and can be purchased with a warranty, so you can sleep better at night. And unlike a private seller who you’ll never see again, the dealership needs you to be happy, as up to 60% of their business comes from referrals. When you consider these factors, buying from a dealership makes great deal of sense. And like the cars, trucks, or SUVs you’re considering, you can “test drive” at the dealership as well. Come in, talk to the sales team and see how they do their business, ask what’s included in the purchase, and inquire as to the types of lenders with which they work. There’s no commitment required. But you’ll quickly see that a private party sale might not be worth the hassle.